Chikka Philippines, the creator of the classic free text messenger, unveiled its text-based application programming interface (API) for use by teams participating at the first ever AngelHack Manila. Hosted by PLDT Group’s IdeaSpace and Smart Developer Network (DevNet) team, this hackathon is actually the Manila leg of the world’s biggest startup hacking competition known as AngelHack Spring Global Challenge. Together with local IT leaders like Chikka Philippines, the organizers welcomed hundreds of young participants from all-over the country to showcase their skills in apps development and vie for the chance to be flown to Silicon Valley for TechCrunch Disrupt, one of the biggest startup conferences in the world. Chikka’s SMS API enables sending and receiving of text messages for various purposes but is more commonly used in mobile verification as well as in other SMS promos and services. “We know what it’s like to be a startup—how exciting it is to work on your own concept, yet, at the same time, be extremely challenged by uncharted territories in the tech business” shared Chikka CEO Chito Bustamante. 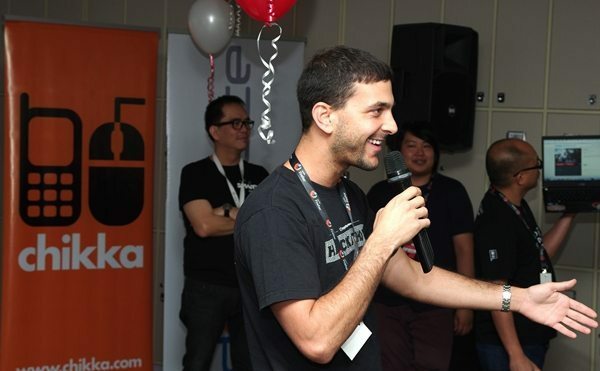 Expressing excitement and pure optimism for the Filipino developer community, AngelHack’s Greg Gopman personally chose to be in the Philippines that weekend despite other AngelHack events were simultaneously being held in about six other cities including Washington DC, Seoul and Kuala Lumpur. “We love being here in the Philippines because we see a lot of great people and great potential. There’s so much technical talent here waiting to be unleashed. The Filipino developer community is inspiring and we think the Philippines is in the top ten emerging countries in the developer scene,” Gopman explained. The winning app “Pagesnapp” was unanimously proclaimed as the most powerful application at the event as it allows small business owners to easily create mobile apps just by using their Facebook pages. “It’s a very unique application. It’s one of those things that other people have tried to do but have not figured out how to do simply,” Gopman said. The Pagesnapp team will fly to Silicon Valley in September and meet the other 30 winners from other cities as they present their startup concepts to tech experts and potential investors at the TechCrunch Disrupt. Chikka Philippines is a wholly owned subsidiary of PLDT-Smart Communications, Inc.